Last Sunday Joe and I and my cousin hiked to the Hollywood sign. It has been on my mental-must-do bucket list for some time and I have heard some interesting takes on the hike. It is certainly iconic and getting up there is a trek in itself! My cousin tried to do it himself last year and turned around half-way, so this time I was sure to get all of us up there! The hike starts at about sea level and gets super steep at the beginning. We were laughing because we saw a few families with strollers pushing themselves up this dusty and dirty hill..and I am thinking..really? The husband tells the wife pushing the stroller, “You can do it honey” as he is blazing past her. I could see her roll her eyes a mile away. Ya, that was interesting. This is the view about half way up the hill. 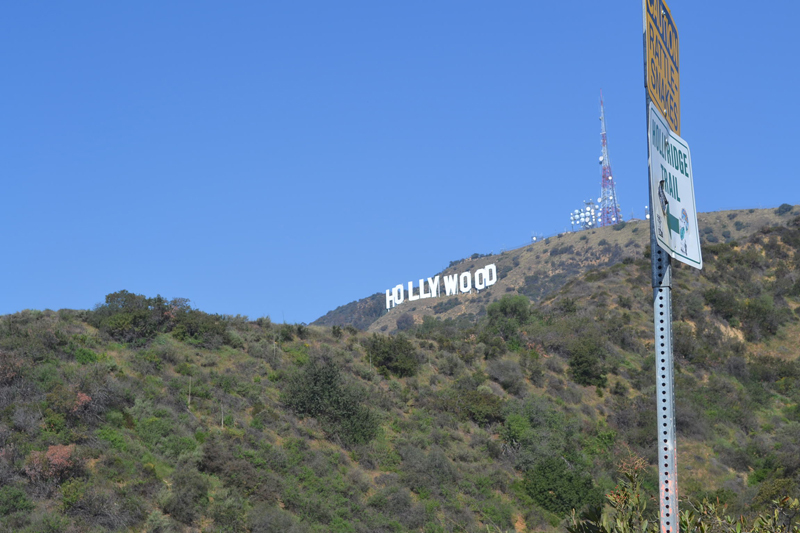 How amazing is it to see the huge Hollywood sign that close? 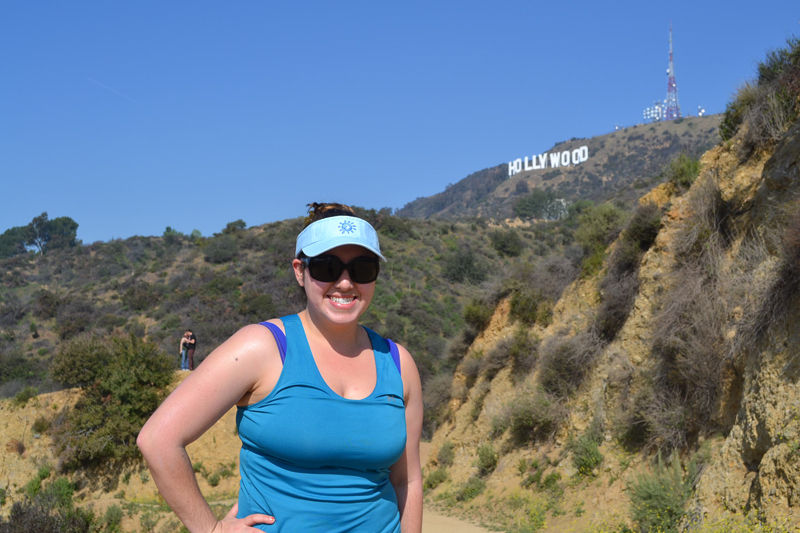 My tip for those who are thinking about the hike: Do it! You will feel so accomplished at the top! Wear comfortable clothes and shoes and lots of sun block and drink water! But..do it! And then finally, there you are standing right behind the letters of the sign and about 1,500 feet up from sea level. Pretty awesome, huh? Sitting in the fridge waiting for us to come home was this amazing sangria! I started weight watchers recently and have been trading my love affair with beer to wine. Now I probably drink wine more often than beer, but I wanted something a little more refreshing and quench relieving (if that makes sense). Something light and fruity and not too sugary. 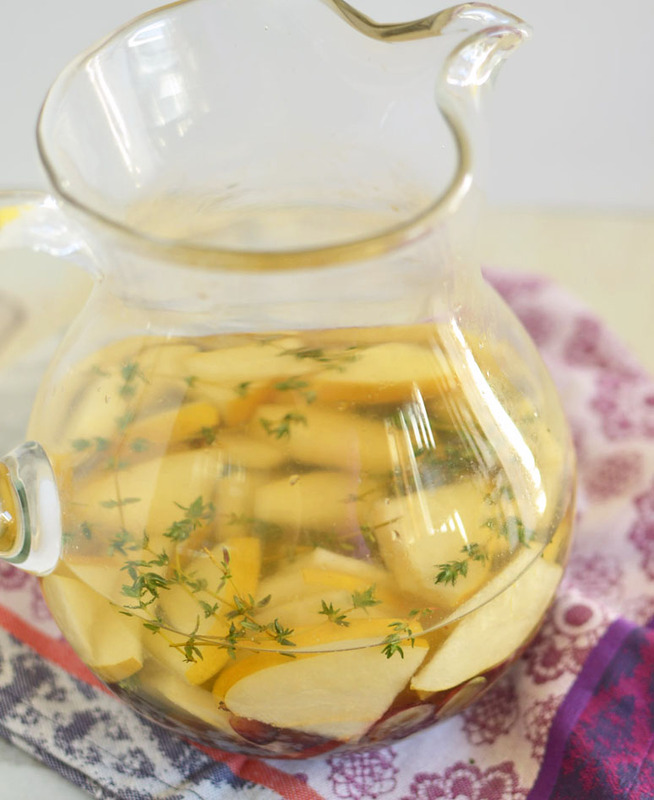 Well…of course sangria came to mind! I have made sangria before, the usual way we do it, with red wine, citrus and whatever fruit juice is in the house. But I was in the mood for something exotic. 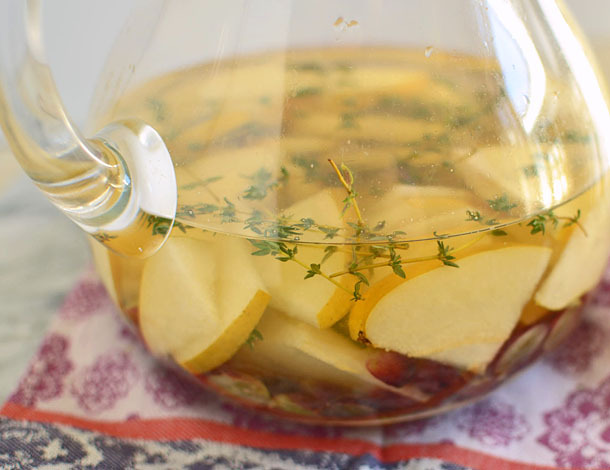 Asian pear, grapes and thyme pulled together to form a gorgeous sangria. If you can let it sit OVERNIGHT, please do! That’s when all the magic happens. To pair with the fruit, I added some St. Germaine which has pear flavors and it was pretty awesome. The fresh thyme offers a light and earthy touch and is a fabulous contrast with the other fruit. I may or may not have gotten a buzz from the wine-soaked fruit. Add everything except for the sparkling water in a large pitcher and refrigerate for at least 4 hours, preferably overnight. Serve and top with a touch of sparkling water if desired. 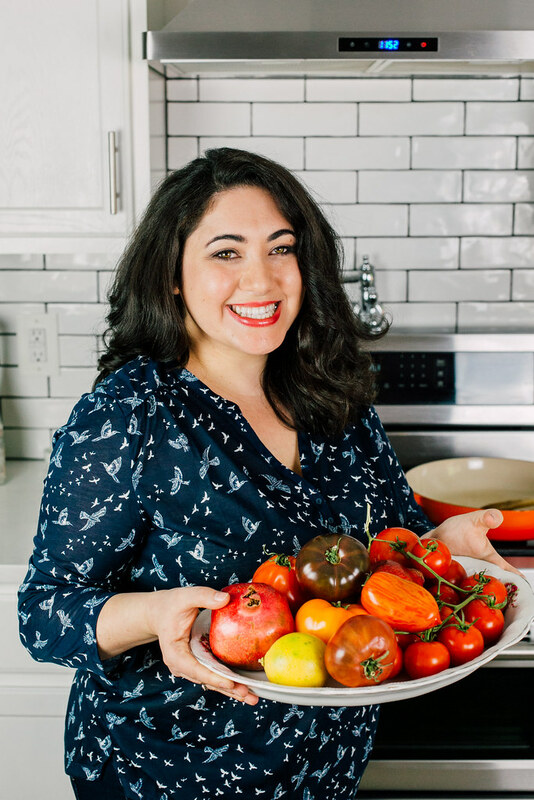 Samantha, this post inspires me to make the hike next time I’m in LA—but no more so than batching up a pitcher of this delectably refreshing beverage. Nice work!